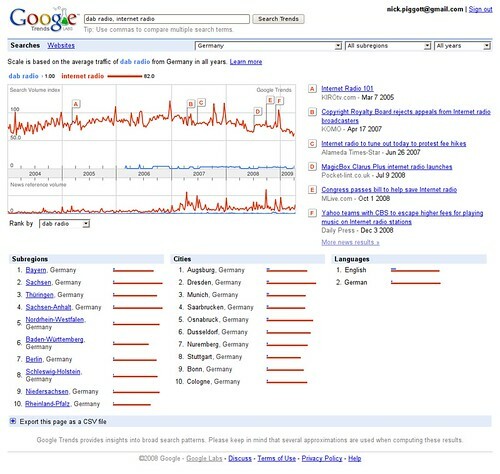 A number of articles and blogs have drawn attention to the ability of Google searches to provide early indications of change. Google announced that they were providing information on people searching for infomation about ‘flu to map outbreaks, and this week there was an article in The Economist about how eerily accurately the decline in people searching about Ford cars was reflected in actual sales decline. So what does Google’s clairvoyance tell us about DAB Digital Radio? Let’s kick off with the basic trend of “dab radio” anywhere the world. As a piece of calibration, this seems about right. Not surprisingly, the two countries that have really “got” DAB, the UK and Denmark, are pulling all the hits. And there’s a surge interest around Christmas which absolutely matches what happens to sales. (And Bristol is high source of traffic – can’t imagine why (OK – probably because Virgin Media have a connection to the Internet here…)). The trend is pretty static, globally – but you can see the growing noise in the press about DAB, which continues fairly unabaited. (No, I can’t explain why Danish is inexplicably the top ranked language. Maybe the pro-rata’ed access to Danish language articles is much higher than to English language articles?). So, let’s narrow it down to the UK. 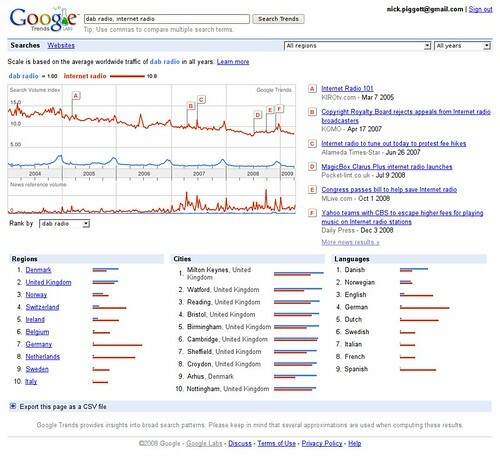 Restricting the analysis to just the UK really don’t change thing very much at all, which probably gives us an insight into how much the volume of queries worldwide is driven by and influence by the UK. 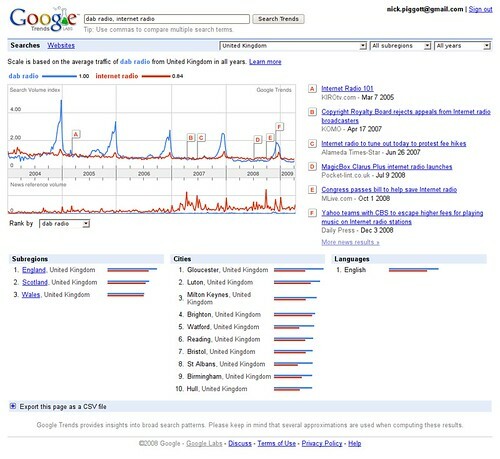 I think this means we probably drive virtually all the Google queries for DAB Radio. (More on that in second). If I remember correctly, 2004 was the first Christmas that the BBC really pushed DAB, probably because they actually had some new radio stations to talk about. My intepretation of the declining peaks at each Christmas is that people need to know less about DAB and need to less searching to find out who sells it. 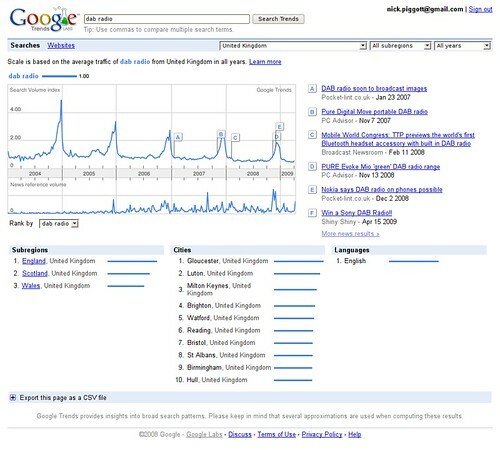 And there is a drift downward in the number volume of queries. Does that mean that people want to know less about it, because they already know enough? Is that too optimistic? But we know the UK is DAB-happy. What about the other big European country which was apparently so enthusiastic about implementing DAB. How does it look in Germany? This looks rather weird. It suggests, from the shape of the graph, that overall query volumes are tiny. I compared the width of the “Country” bar graph (in the Worldwide chart) for the UK (98 pixels) with that for Germany (6 pixels). I know that’s horribly inaccurate, but it indicates that there’s probably about 15-20 times more queries for DAB coming from the UK than Germany. That Bayern comes top of the list doesn’t surprise – but it’s hard to tell if it’s because it’s the Land that is most active in DAB, or just the largest of the Länder. As the media seems to be keen to promote Internet versus DAB as the battle of all time, let’s have a look at the relative performance of those terms in Google Trends. Firstly, across the world. Not entirely surprisingly, globally Internet Radio is searched for a fair bit more than DAB Radio. The average ratio is 10.8 : 1, but that seems to suggest that DAB is actually out performing Internet Radio in terms of interest and search terms. Let’s assume that most of the DAB searches are coming from UK, Denmark and Germany with a combined pop’n of 147m, against a global population of 6.77bn. That’s a much higher proportion of searching for DAB Radio than Internet Radio. (Although people might also be searching for other terms). The decline in the search volumes for Internet Radio is confusing, given that it’s apparently in its ascendancy. It’s much more apparent than the slight decline in DAB searching we saw in the UK. The only explanation I can suggest is that as Google gets used more by “normal” people, they are slightly less inclined to search out Internet Radio than the more geeky early adopters? Or has everyone got an Internet Radio now? You can see from the bottom of this graph the country-by-country breakdown, indexed against DAB. (If you index it against Internet Radio, the country lineup becomes Mexico (! ), Germany, Netherlands, Brazil, Peru, United States, Switzerland, Canada, Spain, Austria). Germany is interesting – more of that in a second. And you can see that in the UK, Internet Radio and DAB radio are about the same. So let’s look at the UK in detail – DAB Radio versus Internet Radio. In the UK, the two search times are neck and neck, with DAB just edging out Internet Radio on the basis of the seasonal interest around Christmas. It’s very interesting that the media perception is that DAB is in a ditch and Internet Radio is it – but that’s not what Google’s users are telling us. Notably, the amount of coverage of Internet Radio (the lower graph) is much much higher than DAB Radio, but it just doesn’t seem to be reflecting or driving interest. That does kind of figure – lots of Media noise about Internet Radio, but real people are looking at both. No DAB huh? I guess people will look for their radio choice va the Internet then. But still that dramatic decline in relative search volumes for Internet Radio recently. I’ll be intruiged to see what this graph looks like once the Germans have started promoting DAB+ to their population. So, what can we conclude fro this graph-fest? In the countries that have promoted DAB, it seems to be in rude health, and with no significant decline in interest, despite generally negative media coverage in the last year or so. Internet Radio doesn’t seem to be growing interest relative to the growing amount of (largely positive) media coverage of it. Relative interest in both DAB and Internet radio is declining as more “normal” people start using Google to look for stuff that interests them. But interest in Internet Radio is declining faster than interest in DAB Radio. In Germany, people are interested in Internet Radio (presumably to seek out choice) and would probably just as interested in DAB Radio if it were promoted with confidence. I’m going to keep an eye on “The Trends” and will maybe update in 6-12 months time. (I’ll also hopefully have some first data for Australia, in which DAB search terms rate 0 across the board). P.S. 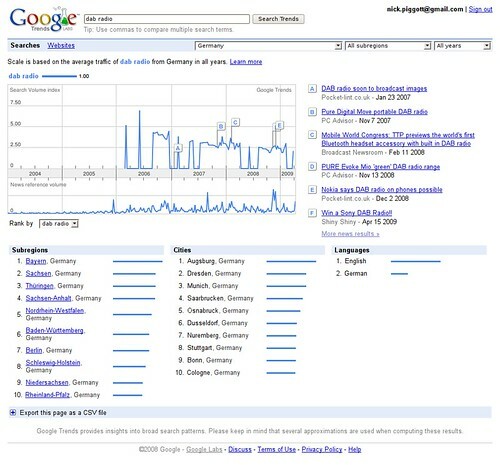 Just to reassure you that the terms DAB Radio and Internet Radio are what German speakers would search for (well, as much as any British person) I speak enough German and know enough German speakers to be reasonably confident that the results aren’t skewed by the language difference. Not unless you’ve got another graph you forgot to include which doesn’t show a continuous decline over more than four years. Not unless you also have a graph to contradict your own fifth one here, which shows unequivocally that the red line overtook the blue one fifteen months ago and hasn’t dipped since, while the blue one continued its four-year slide. I’m more tickled than irritated at your insistence on bringing in the first couple of years of data here for no reason other than to artificially bolster the aggregate totals for ‘dab radio’ at the expense of what has obviously been the truth for some time according to your own evidence presented here. C-, must retake statistics class. Hello John. The interesting thing about statistics is that they require interpretation. 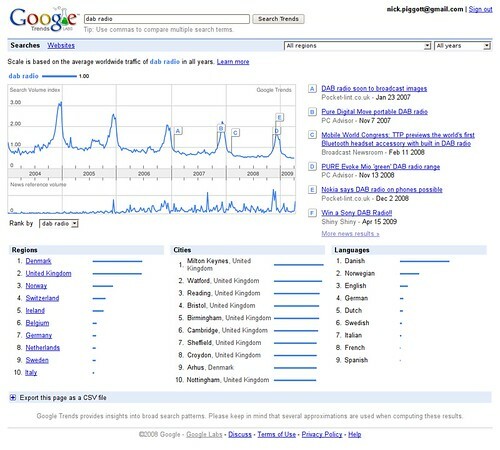 Google Trends show relative search volumes; that is, the relative change in volumes of the specified search terms against all search terms presented to Google in the specified regions and date periods. Yes, “DAB Radio” has declined, as a proportion of the total search volumes in Google. But that’s more than likely because Google is handling a much larger volume of searches as more people come on-line, and DAB is forming a small proportion of those searches. My point is that whilst DAB is declining slowly in the UK as a search time, if you look worldwide at the term Internet Radio, that’s also declining in relative volume, and quite quickly too. Even in the UK, the term “Internet Radio” has declined over the same period as “DAB Radio” has declined. From that, I draw the conclusion that DAB is in as good a shape in terms of public interest, now as it was 3-5 years ago, and certainly not in the terminal state that some media reports suggest. You draw a different conclusion, and without a lot more detailed data, which we can’t get, it’s hard to definitively answer. I used Google Trends to re-graph DAB Radio v Internet Radio in the UK over a more favourable time period for internet radio – the last 12 months. This coincides with the tidal wave of bad news about DAB, and an obvious surge of media coverage about Internet Radio. ( http://www.google.com/trends?q=dab+radio%2C+internet+radio&ctab=0&geo=gb&geor=all&date=ytd&sort=0 ) . Despite that, Internet Radio indexes 1.06 against DAB’s 1.00. Not what I would call conclusive. And both Indexes start and end the 12 month period at exactly the same point, suggesting that trends in both, over that period, were flat. Just out of interest, I re-trended it again, but this time indexing Internet Radio v DAB Radio. ( http://www.google.com/trends?q=dab+radio%2C+internet+radio&ctab=0&geo=gb&geor=all&date=ytd&sort=1 ). This has the interesting effect of showing that the languages most interested in searching for Internet Radio were Polish, German, Portuguese and Spanish. English fell from being the only language (in a DAB Radio search) to fifth position. (Look at the bars next to language). This does seem to concur with the perception that Internet Radio is used by people living here from other countries, looking to listen to radio in their own languages. I wonder how much that affect skews in favour of Internet Radio?